Last year one in three dairy farms chose a new milking parlor for a robot. Twenty years ago, in 1995, it was rather different. Luc Van den Bulck Herenthout in Belgium was one of the first to purchase a robot. He invested time and money and Lely International delivered a dairy robot from the Netherlands. “Many colleagues could hardly believe their eyes,” he says. Behind the scenes, Lely had spent ten years working to develop a robot so the technique from day one was very well put together. Today, 20 years and some software updates later, Luc still milks about 70 cows with the same robot. He’s not sure if he would still be milking cows if it weren’t for the robot. “There's more to life than milking cows,” Luc says. 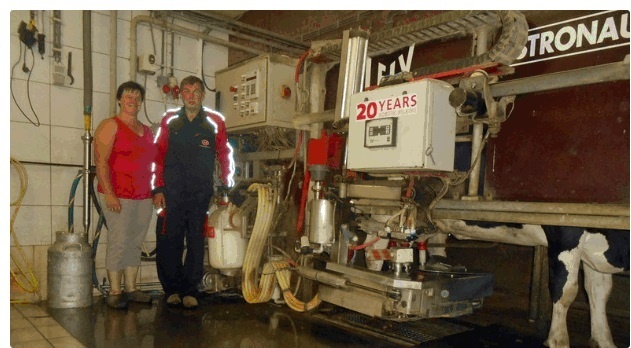 On August 15, 2015 it was exactly 20 years since Kempenaar Luc Van den Bulck started using a robot to milk his cows. Two decades ago, Luc visited the Netherlands to see the robot at work. His first impression was that he liked it wanted to be the first in his country to milk cows with a robot. Times have changed. Today, almost every dairy farmer considers robotic milking when they are building a new barn or renovating their barns. The pros and cons are weighed and compared with a herringbone, carousel, side-by-side or another type parlor. The Milk Control Centre (MCC) of Flanders, which is responsible for the determination of the quality and the composition of raw milk, approves each new milking system before is it started. Their figures show that 30 to 35 percent of the dairy farms in Flanders opt for a robotic milking system when a new milking system is considered. According to statistics by manufacturers of dairy equipment, in 2005, when Luc’s robot was 10 years old, only eight out of 152 dairy farmers opted for a robot. Luc’s installation proved its money worth. “At the time, my parents still milked in a stanchion barn. That is incredibly hard work,” he says. The main reason for choosing a robot was the ease that you have it. As the cows adapted, Luc also changed a few things in the business over the years. Lely is grateful for the technical support and updates from the original robot. “In the early years there were some problems, but it was all in all limited,” Luc says. Lely worked for ten years in secrecy to fine-tune the Lely Astronaut robotic milking system. When introduced, the Lely milking robot was one of a kind. “Once I experienced a failure of software that lasted for 12 hours," Luke recalls. "Everyone knows the honking of cars during rush hour and likewise the cows were nervous to enter the robot. But the failure was quickly corrected by the technician standing there for half an hour with a solution. The rate of intervention was considered one of the greatest concerns of dairy farmers in addition to the cost of a robot. But if Luc were to make the decision again, he would choose a robot. “I will not return to the manual milking in a herringbone parlor or something,” he says. He also likes the more liberal work schedule thanks to the robot, and the fact that he can leave his business with peace of mind for half a day. “In life there is more than just work,” he says again. Luc was 31 years old when he purchased the robot, and as it looks now, the robot will stay with Luc until he is retired. He is satisfied and he recommends a robot to every colleague a robot. "The cows adjust to the robot but not always the farmer,” says Luc. “I know some peers who will never dare trust a robot. However, among the younger generation, it is a different story. They are more accustomed to robotics. In the end, no matter how you consider, it remains a great investment. "